Episode 42 – Live at eMetrics ! | Beyond Web Analytics! Episode 42 – Live at eMetrics ! 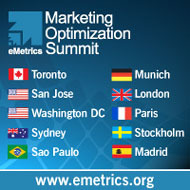 Join Adam and Rudi as they talk to speakers and other attendees at the recent eMetrics out in San Francisco. Hear directly from our guests about the key takeaways from the conference, reasons you should attend, and even some prognostications about the future of our industry. This article was posted in Podcasts, Web Analytics and tagged eMetrics. Bookmark the permalink. Follow comments with the RSS feed for this post.Post a Comment or leave a trackback: Trackback URL. That returns 2 and 3 word phrases.